Description: This color photograph measures 4 x 5 15/16 inches. History: In 1917, William Penn Roudabush, Sr., (1884-1968) moved his family to Wilmington, from Harrisonburg, Virginia. He left behind the hotel business for a new life as a merchant. He opened a general store that carried groceries, hay, grain, and feed at the former site of the Acme Saloon, on the corner of Dock and Front streets. By 1924, Mr. Roudabush decided to specialize in farm and garden plants, seeds, and supplies. Eventually, he built greenhouses to produce plants and flowers for sale in the store. 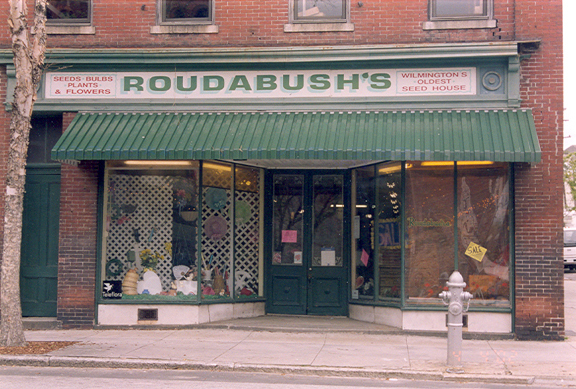 In the 1960s, Roudabush’s offerings expanded to include floral arranging. Roudabush’s Seed Store became a family enterprise when William’s three sons joined the business. William, Jr., (1913-1997) ran the greenhouses, located on Castle Hayne Road, while Emil (1910-1970) and Robert (1924-2002) operated the store. Robert, the last surviving son, managed the business until his recent death in February 2002. When the next generation decided not to carry on the family business, the seed store closed, its inventory was sold, and the building put up for sale.